CCC enrollees throughout the country were credited with renewing the nation's decimated forests by planting an estimated three billion trees from 1933 to 1942. The 1932 Presidential election was more a cry for help from a desperate people near panic as it was an election in a "landslide" vote, the nation turned to Franklin Delano Roosevelt and the Democratic party searching for an end to the rampant unemployment and economic chaos that gripped the country. They weren't disappointed. Accepting the Presidential nomination on July 1, 1932, New York Governor Roosevelt planned a fight against soil erosion and declining timber resources, utilizing the unemployed of large urban areas. Professional foresters and interested layman raised these aims. In what would later be called "The Hundred Days," President Roosevelt revitalized the faith of the nation with several measures, one of which was the Emergency Conservation Work (ECW) Act, more commonly known as the Civilian Conservation Corps. With this action, he brought together two wasted resources, the young men and the land, in an effort to save both. The President wasted no time: He called the 73rd Congress into Emergency Session on March 9, 1933, to hear and authorize his program. He proposed to recruit thousands of unemployed young men, enroll them in a peacetime army, and send them into battle against destruction and erosion of our natural resources. Before it was over, over three million young men engaged in a massive salvage operation, the most popular experiment of the New Deal. The strongest reaction to the proposed CCC program was from organized labor. Its leaders feared a loss of jobs that could be filled with union members. They also looked with alarm at the involvement of the Army believing it might lead to regimentation of labor. Senate Bill 5.598 was introduced in March 27, was through both houses of Congress on the President's desk to be signed on March 31, 1933. Roosevelt promised that, granted emergency powers, he would have 250,000 men in camps by the end of July, 1933. The speed with which the plan moved through proposal, authorization, implementation and operation was a miracle of cooperation among all branches and agencies of the federal government. It was a mobilization of men, material and transportation on a scale never before known in time of peace. From FDR's inauguration on March 4, 1933, to the induction of the first enrollee on April 7, only 37 days had elapsed. Logistics was an immediate problem. The bulk of young unemployed youth was concentrated in the East, while most of the work projects were in the western parts of the country. The Army was the only agency with the slightest capability of merging the two and was in the program from the beginning. Although not totally unprepared, the Army nevertheless devised new plans and methods to meet the challenge. Mobilizing the nation's transportation system, it moved thousands of enrollees from induction centers to working camps. It used its own regular and reserve officers, together with regulars of the Coast Guard, Marine Corps and /Navy to temporarily command camps and companies. The Army was not the only organization to evoke extraordinary efforts to meet the demands of this emergency. Agriculture and Interior were responsible for planning and organizing work to be performed in every state of the union. The Department of Labor, through its state and local relief offices, was responsible for the selection and enrollment of applicants. All four agencies performed their minor miracles in coordination with a National Director of ECW, Robert Fechner, a union vice-president, personally picked by FDR and appointed in accordance with Executive Order 6101, dated April 5, 1933. The administration of the CCC was unprecedented. The same Executive Order that authorized the program and appointed Fechner also established an Advisory Council. Composed of representatives of the Secretaries of War, Labor, and Agriculture and Interior, the Council served for the duration. It had no book of rules. There were none. Never before had there been an agency like the CCC. It was an experiment in top-level management designed to prevent red tape from strangling the newborn agency. Fechner, and later James McEntee, would have their differences with the Council, but unquestionably, each contributed greatly to the success of the CCC. Fechner and the Council were aware that the CCC was FDR's pet project. This attachment, in time, complicated the Director's operations. Technically, Fechner held complete authority. However, the President retained final approval of certain aspects. Decisions as to the location of camps often stagnated on the President's desk until he found time to act. Nevertheless, Fechner proved to be an honest, fairly capable, although often reluctant administrator. However, he was the man for the job, and Roosevelt never regretted the appointment. The program had great public support. Young men flocked to enroll. A poll of Republicans supported it by 67 percent, and another 95 percent of Californians were for it. Colonel McCormick, publisher of the Chicago Tribune, and an implacable hater of Roosevelt, gave the CCC his support. The Soviet Union praised the program…perhaps it saw a touch of socialism. A Chicago judge thought the CCC was largely responsible for a 55 percent reduction in crime by the young men of that day. By April 1934, the Corps, now on a firm foundation, faced the beginning of its second year with near universal approval and praised of the country. This young, inexperienced $30-a-month labor battalion had met and exceeded all expectations. The impact of mandatory, monthly $25.00 allotment checks to families was felt in the economy of the cities and towns all across the nation. More than $72,000,000 in allotments was making life a little easier for the people at home. In communities close to the camps, local purchases averaging about $5,000 monthly staved off failure of many small businesses. The man on the radio could, for a change, say, "There's good news tonight." News from the camps was welcome and good. The enrollees were working hard, eating hearty and gaining weight, while they improved millions of acres of federal and state lands, and parks. New roads were built, telephone lines strung and the first of millions of trees that would be planted had gone into the soil. Glowing reports of the accomplishments of the Corps were printed in major newspapers, even in some that bitterly opposed other phases of the New Deal. President Roosevelt, well pleased with his "baby," announced his intention to extend the Corps for at least another year. The Civilian Conservation Corps in 1935 began the best years of its life. Behind it, for the most part, were early days of drafty tents, ill-fitting uniforms and haphazard work operations. Individual congressmen and senators were quick to realize the importance of the camps to their constituencies and political futures. Soon, letters, telegrams and messages flooded the Director's office most of them demanding the building of new camps in their states. Eventually there would be camps in all states and in Hawaii, Alaska, Puerto Rico and the Virgin Islands. By the end of 1935, there were over 2,650 camps in operation in all states. California had more than 150. Delaware had three. CCC enrollees were performing more than 100 kinds of work. Enrollees numbering 505,782 occupied these camps. Other categories, such as officers, supervisors, educational advisors and administrators swelled the total to more than 600,000 persons. Probably the greatest concentration of CCC personnel was in the Sixth Civilian Conservation Corps District of the First Corps Area, in the Winooski River Valley, Vermont, in December, 1933. It covered a front of about 20 miles from Middlesex to East Barre and five miles in depth from Montpelior to Wrightsville. Headquarters in Montpelior, with 28 work companies and one supply company - 26 white and three black and all veterans of the Spanish-American and World War - together with their officers, enlisted personnel and supervisors totally more than 5,300 persons, occupied four large camps. The Emergency Conservation Work Act made no mention of either education or training. They were not officially introduced until 1937 by the Act that formally created a Civilian Conservation Corps. However, late in 1933, after a number of recommendations were made, President Roosevelt appointed Clarence S. Marsh, the first Director of Education, By 1934, a formal program had begun. It was destined to be controversial and criticized throughout its existence. Even Fechner was never too enthusiastic about the program, suspecting that at camp level it might interfere with the work program. This did not materialize, as only in the later years of the CCC was training authorized during normal working hours. Ultimately, the success - or failure - of the educational program was determined by the initiative and qualifications of the Educational Advisor stationed in each camp. The attitude and cooperation of the camp commander was also important. These programs varied considerably from camp to camp, both in efficiency and results. However, throughout the Corps, more than 400,000 illiterates were taught to read and write. Since most of this training was on the enrollee's own time, undoubtedly each gained that for which he worked the hardest, be it high school diploma, learning to type, or wood carving. Although relief of unemployed youth had been the original objective of the ECW, two important modifications became necessary early in 1933. The first extended enlistment coverage to about 14,000 American Indians whose economic straits were deplorable and had been largely ignored. Before the CCC was terminated, more than 80,000 Native Americans were paid to help reclaim the land that had once been their exclusive domain. The second modification authorized the enrollment of about 25,000 older local men (called LEMS) who, because of their experience or special skills, were vital to train and protect the unskilled enrollee in his transition from city greenhorn to expert handler of axe and shovel. Demands of nearby communities that their own unemployed be eligible for hire were also satisfied. Some complaints of "political patronage" emerged in this endeavor, but no serious scandals ever developed. The appearance of a second Bonus Army in Washington in May, 1933, brought about another unplanned modification when the President issued Executive Order 6129, dated May 11, 1933, authorizing the immediate enrollment of about 25,000 veterans of the Spanish American War and WW1, with no age or marital restrictions. These men were first housed in separate camps and performed duties in conservation suited to their age and physical condition. While not exactly what the veterans had in mind when they marched on Washington, it was an offer that most accepted. A total of nearly 250,000 got belated opportunity to rebuild lives disrupted by earlier serve to their country. The years 1935-36 witnessed not only a peak in the size and popularity of the Corps but revealed the first major attempt to change a system which had proved to be workable and successful since early in 1933. However, before this challenge developed, Congress authorized funded and extended the existence of the CCC until March 1935, with a new ceiling of 600,000 enrollees. This action left little doubt that the "grass roots" and their representatives were more than satisfied with the work of the Civilian Conservation Corps. At first, it appeared there would be no problems in reaching the 600,000-man ceiling. However, a new name had appeared among Roosevelt's advisors. Harry Hopkins established new and uncoordinated ground rules for the selection of enrollees. His procedure, based on relief rolls, effectively ruined the quota systems in use by all the states. Fechner protested violently, and the hassle that developed slowed down the recruiting efforts and generated so much confusion that by September 1935, there were only about 500,000 men located in 2,600 camps. Never again, during the remainder of the life of the Corps, were there as many men in as many camps. While Fechner was still struggling with the changes required by the failure to meet the 600,000-strength figure, he was struck by another change in strategy that spelled disaster to him. Roosevelt quietly informed him to expect a drastic reduction in the number of camps and enrollees in an effort to balance the federal budget in an election year. Roosevelt, a master politician, was aware that a major cut in government spending would be an important selling point in this campaign for re-election. However, in 1936 there were other factors involved that he either ignored or had underestimated. Election year or not, Roosevelt's proposed budget reform invited trouble. As soon as the proposed reduction was announced the floodgates burst, and Congress was besieged with protests. The Corps was at the height of its popularity. No one wanted camps closed, especially those in his area. Republicans and Democrats alike frantically sought a reversal of Roosevelt's policy. The President was adamant. The plan would begin, he insisted, in January, 1936. By June, he wished approximately 300,000 men in about 1,400 camps. Coincidentally, about this time a few camps previously scheduled to close, did so. This action brought another deluge of mail. Congress, sparked by House Democrats, was in open revolt and was determined to take joint action to maintain the Corps at its current strength. Roosevelt and his advisors finally recognized the threat of such an action as a threat to their whole legislative program and wisely called a retreat. He advised Fechner that the proposal had been dropped and that all existing camps and personnel would remain in being. His own party had refused to let him economize in an election year at the expense of the Civilian Conservation Corps. Despite a few problems, the year 1936 was a success for the CCC. 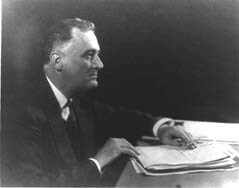 The projects completed had reached high levels, all faithfully recorded and reported to FDR in Fechner's yearly report. It was a proud record, added to each year, so that in 1942, there was hardly a state that couldn't boast of permanent projects left as markers in the passage of "Roosevelt's Tree Army." Some of the specific accomplishments of the Corps during its existence included 3,470 fire towers erected, 97,000 miles of fire roads built, 4,235,000 man-days devoted to fighting fires, and more than three billion trees planted. Five hundred camps were under the control of the Soil Conservation Service, performing erosion control. Erosion was ultimately arrested on more than twenty million acres. The CCC made outstanding contributions in the development of recreational facilities in national, state, county and metropolitan parks. There were 7,153,000 enrollee man-days expended on other related conservation activities. These included protection of range for the Grazing Service, protecting the natural habitats of wildlife, stream improvement, restocking of fish and building small dams for water conservation. Eighty-three camps in 15 western states were assigned 45 projects of this nature. Drainage was another important phase of land conservation and management. There were 84,400,000 acres of good agricultural land dependent on man-made drainage systems, an area equal to the combined states of Ohio, Indiana and Iowa. Forty-six camps were assigned to this work under the direction of the U.S. Bureau of Agriculture Engineering. Indian enrollees did much of this work. Residents of southern Indiana will never forget the emergency work of the CCC during the flooding of the Ohio River in 1937. The combined strength of camps in the area saved countless lives and much property in danger of being swept away. They contributed 1,240,000 man-days of emergency work in floods of the Ohio and Mississippi valleys. Other disasters in which the CCC participated were the floods of Vermont and New York in 1937 and the New England hurricane of 1938. During blizzards of 1936-37 in Utah, 1,000,000 sheep were stranded and in danger of starvation. CCC enrollees braved the drifts and saved the flocks. Few records were kept of the sociological impact of the 1930s on the nation's young men. Many had never been beyond the borders of their state, and others had not even left home. Yet, many would never return. They would choose to remain in towns and villages near their camps. They married, raised families and put down their roots, much as had other young men in the migratory movements of past years. Those who did return, many with brides, came back as successful products of an experiment in living that had renewed and stored their confidence in themselves and in their country. The Civilian Conservation Corps approached maturity in 1937. Hundreds of enrollees had passed through the system and returned home to boast of their experiences, while hundreds more demonstrated their satisfaction by extending their enlistments. Life in the camps had settled down to almost a routine, with work the order of the day, every day, except Sunday. But, after the evening meal the camps came to life as well over a hundred men relaxed and had fun. One building in every camp was a combined dayroom, recreation center and canteen, or PX. In this building, amid the din of Ping-Pong, poker, innumerable bottles of "coke", and occasional beers, were fostered friendships that exist to this day. This, then, was the Civilian Conservation Corps that FDR tried to make permanent in April, 1937. There were many reasons why Congress refused to establish the Corps as a permanent agency. At the time, most of them were probably valid. But never were disenchantment, or failure to recognize the success of the organization, a topic of debate. To the contrary, in a vote of confidence, Congress extended its life as an independent, funded agency for an additional two years. Conceivably Congress still regarded the CCC as a temporary relief organization with an uncertain future, rather than as a bold, progressive solution to the continuing problem of dissipation of our national resources. Whatever the reason, this stunning contradiction was a personal defeat for the President and a punitive restatement of congressional independence. Since his appointment during the hectic days of 1933, Fechner had been able to control the operation of the CCC with but relatively minor challenges to his authority. However, 1939 would bring about a major challenge at a time when he was struggling with internal problems brought about by changing conditions both in the United States and Europe. The storm clouds forming over England and France had already impacted upon the economy of the United States with the result that, as jobs became more plentiful, applications for the CCC declined. But, again it was a sudden change in administration policy that generated the most heat for Fechner and the Civilian Conservation Corps. One of Roosevelt's long-range plans was the reorganization of the administrative functions of some federal agencies. Congress had been reluctant to approve such a move until early in 1939. After much debate, they finally authorized a modified proposal. The Federal Security Agency (FSA) was created to consolidate several offices, service and boards under one Director. The CCC lost its status as an independent agency and was brought into the new organization. Fechner was furious, especially when he learned the Director, FSA, would have authority over him. Appeals to the President were futile as FDR believed the consolidation was desirable. In an angry protest, Fechner submitted his resignation. He withdrew it later, probably at FDR's request. This may have been a mistake as Fechner had been in poor health for some time. Early in December, he was stricken by a massive heart attack and died a few weeks later on New Year's Eve. The Civilian Conservation Corps began a year of change in 1940. The death of Fechner was a severe blow coming at a time when the war in Europe was emerging as the subject of greatest concern to Roosevelt and the Congress. John T. McEntee, appointed by the President to carry on as a Director, was as knowledgeable as Fechner, having been his assistant since the beginning. He was an entirely different personality without the conciliatory talents of his predecessor, and none of his patience. His appointment, strongly opposed by Harold Ickes, another short-tempered individual, increased the friction between the Department of Interior and Director's office and was typical of the problems McEntee inherited and would generate. He served in a different, uncertain atmosphere and received faint praise for his efforts. The Corps itself continued to be popular. Another election year attempt by the President to reduce its strength precipitated a reaction reminiscent of the congressional revolt of 1936. Despite the well-meaning attempt at economy, Congress, with an eye to the folks back home, added $50 million to the CCC's 1940-41 appropriation and the Corps remained at its current strength of about 300,000 enrollees. Congress would never again be as generous. Other major problems were developing within Congress, most related to the defense of the country, and, inevitably, with each crisis, the priority and prestige of the CCC suffered. Those congressmen who had opposed FDR and all of his "New Deal" from the beginning, gained strength, some even calling for termination of the Corps. By late summer, 1941, it was obvious the Corps was in serious trouble. Lack of applicants, desertion and the number of enrollees leaving for jobs had reduced the Corps to fewer than 200,000 men in about 900 camps. There were also disturbing signs that public opinion had been slowly changing. Major newspapers that had long defended and supported the Corps were now questioning the necessity of retaining the CCC when unemployment had practically disappeared. Most agreed there was still work to be done, but they insisted defense came first. Pearl Harbor had shaken the country to its very core, and it soon became obvious that, in a national dedicated to war, any federal project not directly associated with the war effort was in trouble. The joint committee of Congress authorized by the 1941-42 appropriations bill was in session investigating all federal agencies to determine which ones, if any, were essential to the war effort. The CCC, no exception, came under review late in 1941. The findings of the committee was a surprise to no one. The major report recommended the Civilian Conservation Corps be abolished by July 1, 1942. The CCC lived on for a few more months but the end was inevitable. Technically the Corps was never abolished. It was far simpler for Congress just to refuse it any additional money. This the House did in June, 1942, by a narrow vote of 158 to 151. The Senate voted twice and then Vice-President Henry Wallace, to break the tie, voted to fund the CCC. It was a valiant effort, but it didn't work. The Senate-House conference committee compromise finished it by concurring in the House action in return for $8 million to liquidate the agency. The full Senate confirmed the action by voice vote and the Civilian Conservation Corps moved into the pages of history.